This small, agile cyprinid fish only reaches about an inch (3 cm) in length. It has unique bronze color with a pink blush, which you really won’t find on any other aquarium fish. Its color can vary a bit depending on the locality it comes from, with some specimens having a more intense red. Its most distinguishing feature is a black lambchop-shaped marking on the side. 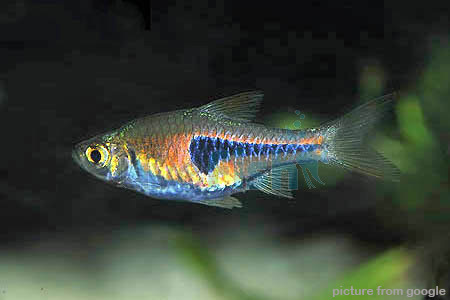 Hence, it is also popularly known as the Lambchop Rasbora, along with some other descriptive common names including False Harlequin, Narrow Wedge Harlequin, and Slim Harlequin.